$100 Gift Certificate winner for April! Congratulations to Jeff & Mary W! You are the most-recent winners of the $100 Gift Certificate! Thank you both for sharing this great photo of your stunning furniture. “Our new kitchen table & bench! We love them & we get so many compliments on how beautiful they are! !” ~ Jeff & Mary W.
We look forward to seeing you in the store when you stop by to spend your $100 gift certificate. 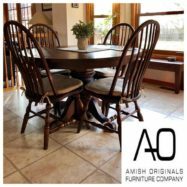 Show us your Amish Originals furnture and you could win a gift certificate too! Submit your entry via Facebook, Pinterest or email at info@amishoriginals.com.